Paul Bourget began his remarkably varied literary career with a collection of poems in the Romantic manner of François Coppée—La vie inquiète (1875). Just as Coppée specialised in depicting the life of everyday working Parisians (Les humbles, 1872), Bourget delighted in creating a serenade in which ‘the old Italian fisherman and his two sons who steer us’ feature as supporting cast. (The poem was written in Ancona.) This is very different from Bourget’s third book of poems, Les aveux (1882), which adopts the rarefied manner of Symbolism and was seized on by Debussy for the texts of such early songs as Paysage sentimental, Voici que le printemps, Romance d’Ariel, Romance, Les cloches and Beau soir. Bourget went on to become an important critic, then a novelist, a member of the Académie Française, and an increasingly right-wing member of the establishment. He was born three years before Chausson, but died only in 1935—a fact which reminds us that the composer‘s life was tragically short. Sérénade italienne is perhaps Chausson’s most extrovert mélodie, certainly the only one when we feel ourselves buffetted by the elements. If there is something facile in the accompanying triplets, the tugging undercurrent of the left hand with its two-against-three rhythms in the bass clef seems Brahmsian (Chausson might well have known a song like Liebestreu) and adds interesting detail to what might have been empty pianistic oscillations. 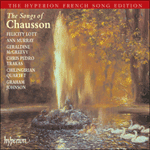 The Italian serenata required by the poem (this is Chausson’s only foray into Mediterranean pastiche) makes the composer dare to write music of a more sentimental and enthusiastic nature than usual. There is even something noble about the sweep of unfolding panorama which rippling arpeggios do nothing to undermine; tolling bell-like minims in the left hand add gravitas to sentimentality. Isabelle Bretaudeau speaks of a ‘sensation de profondeur, d’espace—de vaste respiration’ and in this way the music reminds one of Duparc: the verse beginning ‘Sur la mer calme et sombre’ (the music here switches from E major to A flat) seems to be situated beneath as grand a heavenly cupola as that of Phidyle, and shares that song’s tonality. The shameless exploitation of a gorgeous enharmonic modulation (E flat on the word ‘vois’ in A flat major becomes D sharp on the word ‘nous’ in B major) is effective while the Liberace-like cascades of the postlude now seem a hackneyed expression of pianistic exuberance. And spend the night beneath the stars. To swell the canvas of the sails. No words that we exchange. Our souls may both commune. Save the night, the sky and the waves.